Panamanians take justifiable pride in their operation of the Panama Canal. Since the U.S. handed the famous waterway over to Panama nine years ago, the independent Panama Canal Authority (ACP) has run it more efficiently, more safely and more profitably than the Americans did. Too bad, most Panamanians say, that their government is still best known for the kind of corruption and waste that has marred the small Central American country's reputation ever since pirates haunted the Caribbean. If they could just run the nation the way they run the canal, Panamanians believe, they could become a world-class maritime commercial and financial center  the Hong Kong of the Americas. Or maybe give Miami a run as the unofficial capital of Latin America. Martinelli is bucking a leftward trend in Central America  a region that, despite its signing of a free-trade pact with the U.S. a few years ago, has since seen leftist Presidents take power in Nicaragua and El Salvador and more centrist governments like those in Honduras and Costa Rica join energy alliances with left-wing Venezuelan President Hugo Chávez. "I think this shows that, at least in countries where the democratic rules of the game are accepted, more right-of-center politicians like [President Alvaro] Uribe in Colombia or [President Felipe] Calderón in Mexico can, of course, compete in Latin America," says Susan Kaufman Purcell, director of the Center for Hemispheric Policy at the University of Miami. "If they display a social component, especially a concern for poor people, then a responsible and competent businessman like Martinelli is a strong alternative." Martinelli's party, Democratic Change, and other allies also won a comfortable majority in the National Assembly, which may make it easier for him to realize his aggressive reform agenda. That includes budget reductions, more business-friendly labor reforms as well as financial and tax changes. 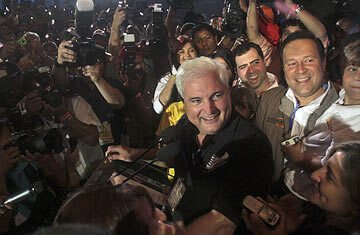 Still, Martinelli's affable but strong executive personality  he's known as an imperious, sometimes right-wing businessman accustomed to seeing his orders carried out immediately  will have to battle Panama's notoriously slow and entrenched government bureaucracy. Martinelli, who takes office July 1, will also have a delicate U.S.-related issue atop his desk: pushing the U.S. Congress to ratify the separate, bilateral free-trade agreement that Panama City and Washington signed in 2006. President Barack Obama favors it, but its passage in the U.S. has been in doubt because many in Congress are angry that Pedro Miguel Gonzalez  who has been indicted in the U.S. for the killing of a U.S. soldier in 1991  remained president of Panama's National Assembly (until September 2008) amid the controversy. Gonzalez lost his Assembly seat in Sunday's election, however, and with it his parliamentary immunity. Although he is unlikely to be extradited to the U.S. (Panamanian law forbids the extradition of nationals), his ouster from the Assembly may remove a significant obstacle to the free-trade pact. As the chief of Panama, but only the nominal boss of the canal authority, Martinelli will have little technical control over what will be the nation's most important order of business during his five-year presidency (he is constitutionally limited to one term). That's the Panama Canal expansion, a massive dig that will add a third set of locks able to handle the supersize, "post-Panamax" ships. Those vessels can hold up to 12,000 20-ft.-long containers and are considered the future of commercial-cargo shipping. But Martinelli may well be the President who cuts the new locks' ribbons. That moment could make Panama the kind of player in the western hemisphere that Singapore is in the eastern  provided Panama finally has a competent, trustworthy administration in place. "Panama is already becoming a type of counterpole to Miami in terms of where Latin Americans are looking to park their resources," says Kaufman Purcell. "Voters chose Martinelli in large part to see that through." Panamanians will have to hope now that by the time the locks' expansion and Martinelli's presidency are finished, they'll have both a canal and a government to be proud of. See pictures of South America at LIFE.com.